Twenty-one miles from Boston, lies the community of Acton; voted one of the top 20 small communities by Money Magazine. Acton is a historic community with a forward thinking attitude evidenced by gracious tree line streets, top scoring schools and over 1,650 acres of conservation lands owned by the town. The population of approximately 23,000 enjoys beautiful parks, a beach on a man-made lake, sports fields and open spaces. Museums, libraries and theater performances provide culture and entertainment for residents. Actors, sports legends, and captains of industry have all called Acton home. You may also enjoy living in this quiet forested community. Geologists believe the geography of Acton was formed by the retreat of the last glaciers ten thousand years ago. As indicators, they site the nine spoon shaped hills formed by glacial till, called drumlins, and two kettle ponds formed by depressions of large blocks of ice. Today, those kettle ponds are Wills Hole and Grassy Pond. 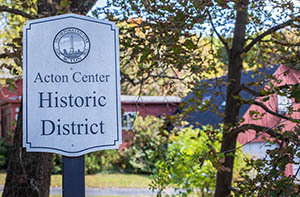 Incorporated in 1735, Acton's history is well documented with annual town meeting records found at the Memorial Library. On October 3, 1774, Acton residents banded with those hostile to Great Britain by drawing up a list of grievances and sending it to King George III. That event, known as Crown Resistance Day, is celebrated annually. The National Register of Historic Places lists two Acton structures, The Faulkner Homestead, which dates back to 1707; and Jones Tavern, also dating back to the revolutionary era. In April of 1775, Captain Isaac Davis was among the Acton Minutemen who responded to the call to arms of Paul Revere, William Dawes, and Samuel Prescott. Prescott made it to Acton and fought with the Minutemen at the North Bridge in the battle of Lexington, fought in Concord by the men of Acton. Captain Isaac Davis was the first officer to die in the American Revolution. The community stands as a memorial to Captain Davis' service. Robert Frost penned the thought provoking poem "The Vanishing Red" about Acton. Was the movie "Labor Day" by Joyce Maynard part of your watchlist in 2013? Did you know the lead actors Kate Winslet and Josh Brolin, along with the rest of the cast and crew filmed in various locations throughout Massachusetts, including Acton where filming moved to on January 25, 2012? Scenes were shot around Piper Road, as well as a home located nearby. If you have not watched it yet, be on the lookout for familiar locations, or watch it again to see what you may have missed the first time around.